No Sift next week. The next new articles will appear on February 6. We are not enemies, but friends. We must not be enemies. Though passion may have strained, it must not break our bonds of affection. The mystic chords of memory, stretching from every battle-field and patriot grave to every living heart and hearthstone all over this broad land, will yet swell the chorus of the Union when again touched, as surely they will be, by the better angels of our nature. Should I keep tweeting or not? I think so. You know, the enemies keep saying “Oh, that’s terrible.” But it’s a way of bypassing dishonest media. If juxtaposing the two quotes isn’t clear enough, let me spell it out: Presidents aren’t supposed to cast other Americans as their enemies. They may think of people that way in their own minds, as President Nixon did when he compiled his enemies list. In public, a president may portray loyal American citizens as critics, political opponents, and even (as re-election approaches) rivals. But not enemies. This is one of the many things Trump seems not to grasp about being presidential. This week’s featured post is “The legitimacy and illegitimacy of Donald Trump“. Next Sunday I’ll be speaking at First Parish Church of Billerica, MA on “The Hope of a Humanist”. Donald Trump became President Friday at around noon. His first act as president was to give a short, dark, and very strange inaugural address that at times seemed to be channeling the speech the supervillain Bane gives in The Dark Knight Rises. But of course, nationalistic movements are famously bigoted against racial and religious minorities, and bigoted movements often cloak themselves in nationalism: The targeted group is a cancer on the nation, and must be eradicated if the rest of us are to survive and thrive. “Total allegiance” can become a rigged test: Once the government begins systematically oppressing a group, any profession of “total allegiance” rings false. We will … unite the civilized world against radical Islamic terrorism, which we will eradicate completely from the face of the Earth. Trump also invoked the image of war as a nationalizing influence. A new national pride will stir our souls, lift our sights, and heal our divisions. It is time to remember that old wisdom our soldiers will never forget: that whether we are black or brown or white, we all bleed the same red blood of patriots, we all enjoy the same glorious freedoms, and we all salute the same great American Flag. He also referred to Americans as “God’s people” and announced that “we are protected by God”, a theological claim I don’t remember hearing from a president before. Presidents typically hope or pray that God will favor our nation, or call on us to be worthy of God’s favor. But I don’t recall any previous president expressing such religious entitlement. In JFK’s inaugural, he told us that “God’s work must truly be our own”, not that our work must necessarily be God’s. Lincoln’s second inaugural warned us that “The Almighty has his own purposes.” But Trump apparently knows God’s mind better than Kennedy or Lincoln did. Trump’s inauguration drew a much smaller crowd than Obama’s eight years ago, as you can clearly see in these side-by-side photos. Trump seems sensitive about his relative unpopularity, as he is whenever reality punctures his over-aggrandized self-image. He claimed — apparently based on nothing more than his own view from the podium — that his crowd broke all records. He went on a rant about the “dishonest” media correctly reporting his crowd size (while talking at the CIA, of all places), and sent Press Secretary Sean Spicer out to harangue the press about it without allowing them any questions, as if they were disobedient children. CNN did something similar in its article “White House press secretary attacks media for accurately reporting inauguration crowds“. So did The New York Times in “With False Claims, Trump Attacks Media on Turnout and Intelligence Rift“. Chris Cillizza’s The Fix column, which is commentary rather than straight news, annotated Press Secretary Sean Spicer’s rant at the press. These all demonstrate a similar philosophy on covering Trump, and I hope it catches on. Wait a minute. Alternative facts? … Look, alternative facts are not facts. They’re falsehoods. On paper, Trump’s visit to the CIA looked like a good bridge-building move, after he had compared our intelligence services to Nazis. But Trump never bothers to learn the culture of the people he’s talking to — they’re supposed to adjust to him, not him to them — so he committed a major sacrilege: He gave a rambling, self-aggrandizing, partisan speech in front of the wall devoted to agents killed in the line of duty. At Slate, Nora Caplan-Bricker points out something I hadn’t noticed: Only Democratic presidents have inaugural poets. JFK started the tradition when Robert Frost recited a poem at his inauguration, and every Democrat but LBJ has continued it. No Republican has. And they plagiarized Obama’s cake. I’m pretty good at estimating crowds in the hundreds, but when they get into the tens of thousands their sizes are impossible to know with any accuracy unless there is a gate with turnstiles. (JFK used to joke about it. When asked how his campaign got their crowd estimates, he quipped: “Salinger counts the nuns and multiplies by a thousand.”) Saturday, I was at the Women’s March on the Boston Common, variously estimated at 100-175K. I have no idea. It was a whole bunch of people. Estimates are also all over the map for the other large sister marches: I’ve heard numbers as high as a quarter million in Chicago, three-quarters in Los Angeles, and another quarter million or so in New York. Nobody really knows. They were big, and there were hundreds of them all over the country. 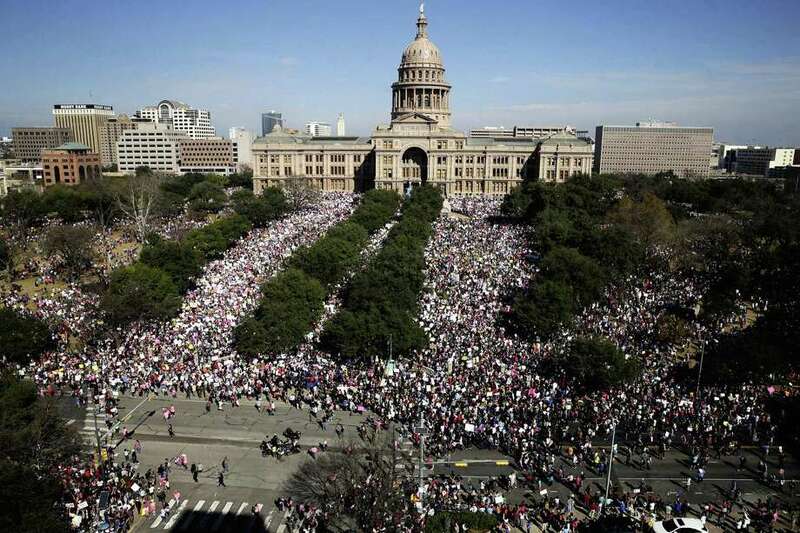 Here was a view of Austin, which as far as I know got no national coverage at all. The total number of marchers nationwide has been estimated at between 3.3 and 4.6 million, or about 1% of the population. The NYT had “crowd scientists” analyze crowds for both Trump’s inauguration and the D.C. Women’s March. In both cases they came up with numbers somewhat smaller than most, for what that’s worth: 160K for Trump and 470K for the Women’s March. So let’s just stick with “a whole bunch of people” and reflect on what that means. Nobody really thinks this will make Trump himself change his ways, or that lots of Trump supporters will look at the crowds and say, “If so many people disagree with me, I must be wrong.” So what’s the significance? There’s both an inner and an outer significance. The people who attended got energized and confirmed in their identities as resisters. Some percentage of them will progress to activism as a serious commitment, and the rest will be more likely to challenge Trump propaganda as they run into it. If we’re talking about millions of people, that makes for a definite change in the national conversation. The outer significance has to do with what I’ve been thinking of as the Nightmare Scenario, where Trump’s election takes us down a path towards an authoritarian government. I don’t believe that Republicans in general want such a thing, but authoritarian leaders gain power by intimidating people into going along, and then into going much farther than they ever thought they would. If Trump were surrounded by a winning aura and seen to be wildly popular, other powerful politicians (like Paul Ryan) might think that they had no choice but to support him in whatever he does. Democrats might be intimidated into providing only token opposition. Even judges get swayed by what they imagine public opinion to be. In the Nightmare Scenario, a Trump-is-the-voice-of-the-People frame becomes the subliminal basis of his press coverage. Rather than the blunt this-is-false coverage I described above, the press would shade into calling his falsehoods “controversial” or simply quoting them side-by-side with other people saying something different, as if there were no way to know the underlying facts. Little-by-little, the authoritarian government would capture the supposedly free press. Raising big crowds against Trump the day after his inauguration interrupts that dynamic. It makes visible what the polls tell us, and what Trump’s defeat in the popular vote should tell us: He is not popular. Politically, there is no reason to be intimidated by him, and tying your future to his is a risky strategy for any politician. For now, Ryan and McConnell and the rest of the Republicans in Congress will continue to explore what they can get out of a Republican president, but Saturday reminded them that they need to keep their eyes on the exits. Two weeks ago, I pointed you at Indivisible, a guide for influencing your congressperson, written by former congressional staff people. It’s largely based on the effective protests the newly organized Tea Party launched against ObamaCare in the summer of 2010. The underlying point is that congresspeople, whatever their party or ideology, live in fear of organized groups of their constituents, even fairly small groups. They especially fear groups that know how to get media attention, who can make them look out-of-touch with the voters of their districts. You can use that. Indivisible-like protest actions are starting to happen. In this Aurora, Colorado event, covered by Channel 9 in Denver, people afraid of losing their health insurance overwhelmed Republican Congressman Mike Coffman. He intended to have short one-on-one meetings with voters in a room at the Aurora Library. But hundred of constituents showed up to ask about his plan for helping them after he succeeds in repealing ObamaCare. He didn’t adjust his format and left early, with many people still in line to see him. The Channel 9 piece looks pretty bad for him. If it becomes widely known that Republican congressmen don’t dare meet their voters for fear of similar incidents, the idea that ObamaCare repeal is popular will go down the drain. Mattis at Defense and Kelly at Homeland Security have been approved. The Republican opposition to Tillerson at State seems to be evaporating. But the hearings have revealed a lot of problems, which Paul Waldman summarizes. Under the standards that applied to all previous administrations, I think Mnuchin at Treasury and Price at HHS would have been withdrawn already. President Obama under-used his pardon power for eight years, but he did commute the sentence of Chelsea Manning, who will be released in May. The dangerous anti-police atmosphere in America is wrong. The Trump Administration will end it. I interpret this to mean that the Justice Department will no longer pay much attention to police killings. In the long run, this will be really unfortunate, not just for the public, but for many police as well. During the controversy over the Michael Brown shooting in Ferguson, it was hard to know who was telling the real story. The behavior of local police made it clear that their priority was to get their guy off, not to find the truth. The only thing that convinced me that Darren Wilson should not have been charged with murder was when the Justice Department’s investigation came out. Otherwise, there would never have been any trustworthy report. That’s what will happen going forward. Police will continue to kill young black men, including some who are unarmed or unthreatening. Local investigations will declare those killings justified, whether they are or not. And that will be the end of the story. Citizens who dislike or distrust the police will assume they got away with murder, whether they did or not. Online records of the Obama administration have not gone away completely. An archive of the Obama White House site is here, though it is not being maintained or updated any more. This week had a lot of wintry seriousness in it. So let’s imagine that it’s June in New York City. You’re cruising through the theater district on a sunny afternoon. Who might you give a ride to? After a long absence, The Twilight Zone returns with one of the most ambitious, expensive and controversial productions in broadcast history. Sci-fi writers have dabbled often with alternative history stories – among the most common is the “What If The Nazis Had Won The Second World War” setting – but this huge interactive virtual reality project, which will unfold on TV, in the press, and on Twitter over the next four years, sets out to build an ongoing alternative present. The story begins in a nightmarish version of 2017 in which huge sections of the US electorate have somehow been duped into voting to make Donald Trump president. It sounds far-fetched, and it is, but as it goes on it becomes more and more chillingly plausible. Today’s feature-length opener concentrates on the gaudy inauguration of President Trump, and the stirrings of protest and despair surrounding the ceremony, while pundits speculate gravely on what lies ahead. It’s a flawed piece, but a disturbing glimpse of the horrors we could stumble into, if we’re not careful. BRILLIANT!!! Leave it to the Brits/Scots to really get it. Yes, a very strange and disturbing week, from Trump’s inaugural tantrum to his spokesperson’s “alternative facts.” Truly mind-bogling. Thanks especially for the Lakoff link, glad someone actually has a theory of how Trump’s mind works. In the interest both of reaching out to disillusioned Trump voters and encouraging self-reflection among the Democratic faithful, I wonder if we should bring up Clinton as an aside here. The first thing that came to mind after reading the top of the post was of course the “basket of deplorables.” Surely that phrase finds itself much closer to “enemy” than “rival” on the spectrum, and to that extent we should be clear about distancing ourselves from such divisive language. Personally I think Trump’s language is worse as it explicitly uses “enemy” and was coming from a sitting President. But just as many liberals saw Trump voters as tacitly condoning his racism and sexism, I could imagine an on-the-fence conservative seeing a vote for Hillary as tacitly condoning the designation of half of republican voters as deplorable. If democrats refuse to acknowledge that or, worse, double down on the “deplorable” line of thinking, I doubt many fellow Americans will be won over. Maybe our case would be better received if we showed some consistency on this and other points. Similarly, Democrats are supposed to have insulted Christians in all sorts of ways, mainly because conservative Christians are looking for insults and will mine them out of whatever ore they are presented with. If liberals restrain our rhetoric to things that can’t be twisted into insults by people who work hard to find insults, we won’t be able to say anything at all. That’s a far more restrictive standard than just not calling American citizens “enemies”. Clinton did call half of Trump supporters, and by extension half of those who went on to vote Republican, deplorable and irredeemable. Am I an overly sensitive bleeding heart for not seeing a lot of chewing or twisting necessary to find that insulting? As a thought experiment, imagine being an on-the-fence independent/undecided voter, and you hear one of the candidates call half of one party, let’s even say it’s the party that your family raised you in, irredeemable deplorables. Would you find that alienating? Would that make you more or less open to hearing out that candidate and that candidate’s party? The semantics of the “basket” case aside, there does seem to be a trend among some Democrats to blanket judge Republicans as stupid, racist, etc. and I’d like us to push back on that because I don’t see it winning many hearts and minds. What seems more inspiring, what seems more appropriate to the big issues we face today, aiming for a half loaf, or aiming for a double victory? You’re ignoring the fact that Trump very explicitly appealed to racism, sexism, xenophobia, Islamophobia and so on, and that his popularity went up whenever he did. How exactly should Clinton have called that out? Or should she just have ignored it and pretended that these dark tendencies weren’t fueling the Trump campaign? The repression of minority groups will accelerate under trump, and the Justice Department will abandon enforcement of Civil Rights laws. Back in the 60s, groups formed in minority communities to protect themselves from authorities; it will be interesting to see if this happens again. “I’m sure that among “real Americans”, i.e., white straight native-born Christians, Trump won a landslide. )” Please be careful in your descriptions. I am a white, straight, native-born Christian, and I did not vote for Trump. I think you need another adjective (or three)! Thank you for your blog – I read it every week! While it is comforting to think of the Trump supporter as a dupe, it negates the Trump voter’s agency. In this day and age, they knew what kind of man Trump was. They could have done the research and looked at the original documents. They could have listened to the critics and tried to understand why the critics were critical of Trump. But they didn’t. They voted for Trump because of Trump. Internet. Newspapers. Opinion shows. Friends and family. Co-workers. News programs. I’m not sure what the word could be that would encompass what the Trump voter is, but I’ve come to the realization that the word “duped” is not one of them . Perhaps “naive”? Power hungry? Evil? But not “duped”. They weren’t tricked. The information is and was readily available. I agree. If any voters were “duped” in this election, it was the ones who chose to sit it out rather than vote for Hillary because of the mostly-smoke-and-mirrors questions raised over the decades by her Republican foes. My statement is literally true, if you look at the exit polls. A landslide doesn’t mean that it was unanimous. Trump won the white vote by 21%, without adding the other adjectives. Your comment on Trump’s invocation of God in his inauguration speech was interesting. I read this article on the role of religion in the Civil War(https://www.theatlantic.com/politics/archive/2015/08/did-religion-make-the-american-civil-war-worse/401633/). Lincoln’s remark that “The Almighty has his own purposes” was linked to his Calvinist upbringing and his willingness to compromise in order to unite the nation (e.g. Emancipation Proclamation’s exclusion of Northern slave states), but others did not shy away from professing to know God’s will. It would be cool if you could do a post on the history of religion and the state in the US. Thanks for the recommendation. Is it your blog? Good points, but might claiming that God is on the side of the ACLU be counter-productive? I’m reminded of the Parable of the Pharisees and the Tax Collector (disclaimer: not Christian). Not my blog – created and run by Chris Ladd. The comparison between God and the ACLU is pure irony although personally, I have been a supporter of the ACLU’s work for years. IMO, the work they do reflects the parables that teach humility, kindness, and compassion. Another outstanding, lesser known program that is more localized is the Equal Justice Initiative organized by Bryan Stevenson. Check it out.